We have to remember what's important in life: waffles, friends and work. But most importantly, waffles. 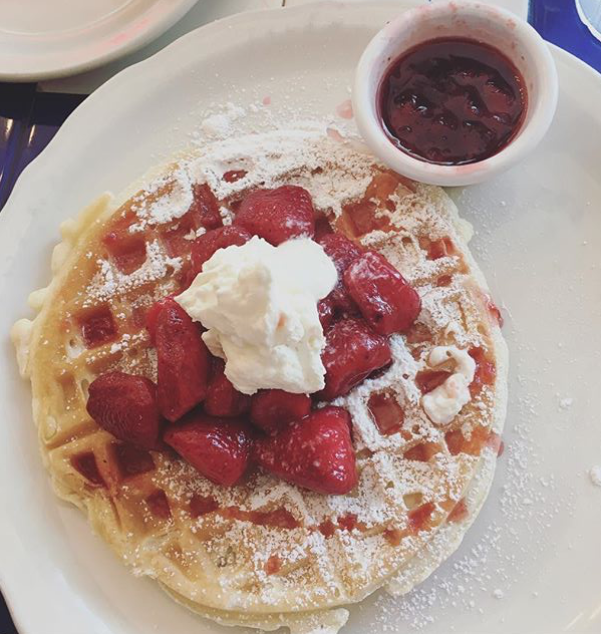 If Leslie Knope has taught us anything, it’s that waffles are a source of pure joy and happiness in life, and a staple of all breakfasts, topped with extra whipped cream of course. To ensure that everyone in America can enjoy a delicious waffle for breakfast, lunch, or dinner (because honestly waffles are good any time of the day), I scoured the Internet and various social media outlets for several long, tiring days to give you this list of the best waffles in every state. You might be thinking this list is a scam since I’m starting it off with a pancake house, but trust me, this place makes to-die-for waffles that are just as good as their pancakes. Every batter is made fresh in the kitchen, with fine ingredients and family recipes. They serve their waffles golden brown, for the ultimate experience of a crusty exterior and a fluffy interior. Choose from a plain waffle drizzled with hot syrup and whipped butter, or get it filled with toasted coconut, crispy bacon, blueberries, pecans, or fresh Granny Smith apples. Obviously this list is proving that great pancakes = great waffles. Bringing some sunshine and warmth to Anchorage, Kava’s is putting their own twist on traditional Hawaiian breakfast dishes, as well as typical American fare. The favorite waffle here is the Ono Waffle, a thick waffle topped with heaps of peanut butter, chocolate sauce, bananas, and whipped cream. Get it with a side of reindeer sausage because Alaska is probably the only place you’ll ever come across it. This small hole-in-the-wall restaurant in Tarzana doesn’t even have it’s own website, but they sure as hell have some good waffles. 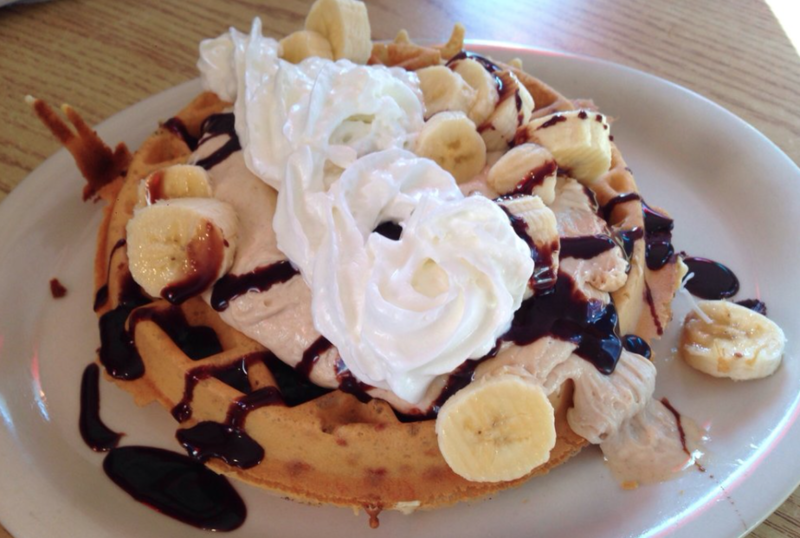 The Wacky Waffle is a crowd favorite, topped with crushed Oreos, bananas, ice cream, and chocolate. Sure it sounds wacky, but I’d eat it no questions asked. 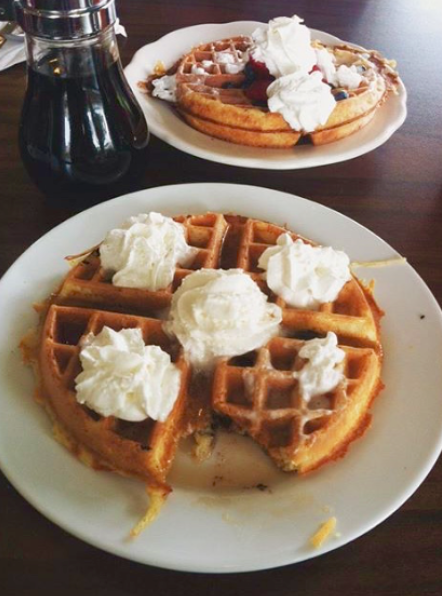 #SpoonTip: Visit Cici’s in the fall for the Drama Queen waffle, a pumpkin waffle with pumpkin marmalade and whipped cream. Beats a pumpkin spice latte hands down. We all know the best places to get any sort of food are hidden, hole-in-the wall mom and pop restaurants. For this place’s waffles, it’s especially true. Their “specialty” waffles include strawberry, blueberry, or pecan. 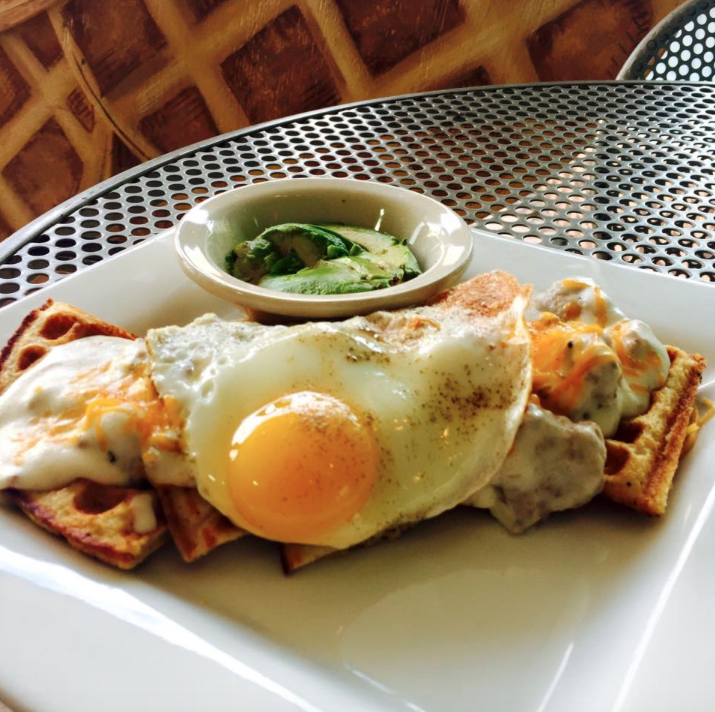 If you’re extra hungry, they’ve got you covered with waffle combos that come with your choice of waffles and eggs, bacon, sausage, ham, or all of the above. 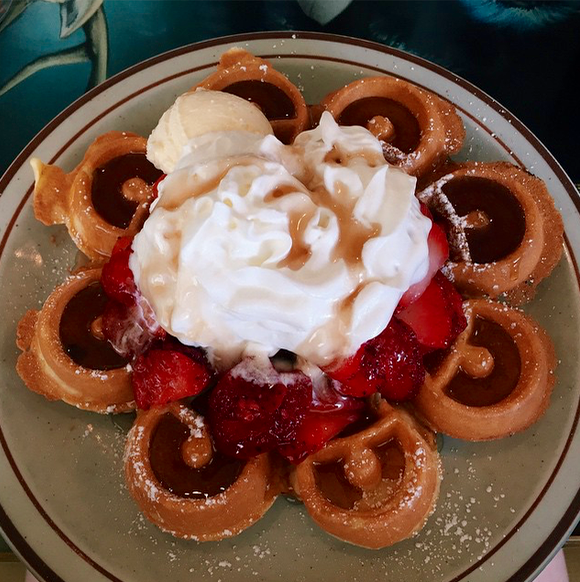 During my search for the best waffles in California I came across hundreds of different places, and while they all seemed amazing, The Iron Press in Anaheim seemed to be one of the most popular. 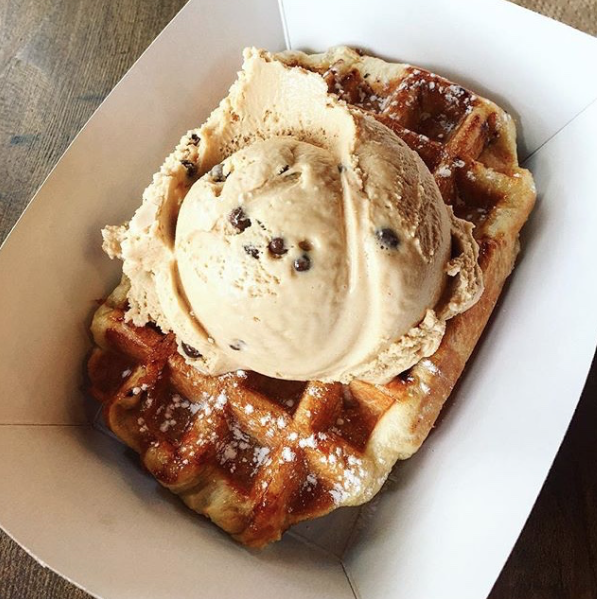 They’re serving up all kinds of both sweet and savory waffles, like jalapeño cheddar waffles, herb waffles, bacon and smoked gouda waffles, churro waffles, and of course the classic Belgian waffle. Choose from their menu of out-there waffle sandwiches and toppings, which include ingredients like cereal and milk drizzle, prosciutto, or a house-made burger, just to name a few. At this breakfast joint in downtown Denver they’ve created over eight tasty handcrafted syrup flavors for your choosing on their buttermilk Belgian-style waffles, including maple vanilla, butterscotch, Kahlua, apricot, and coconut syrups. 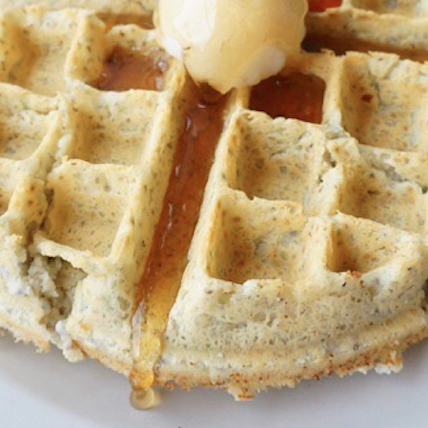 Syrup’s gluten-free waffles allow everyone to enjoy their amazing waffles creations. So get pouring. This preppy Yale breakfast spot is run by two Belgians whose menu reflects the best food and culture the heart of Europe has to offer. Since you might not be able to actually ever go to Belgium, I highly recommend you try this place out. 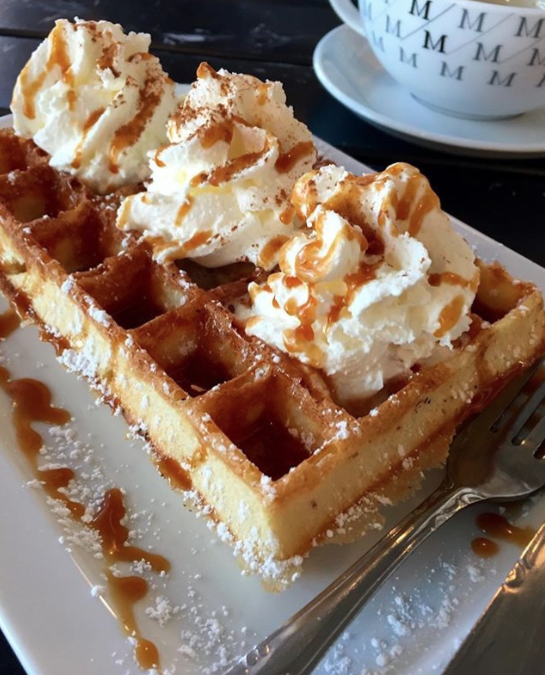 Their famous Belgian waffles are house-made and served with powdered sugar and whipped cream, along with your choice of Belgian chocolate sauce, salted caramel drizzle, New England maple syrup, or fresh cut fruit. 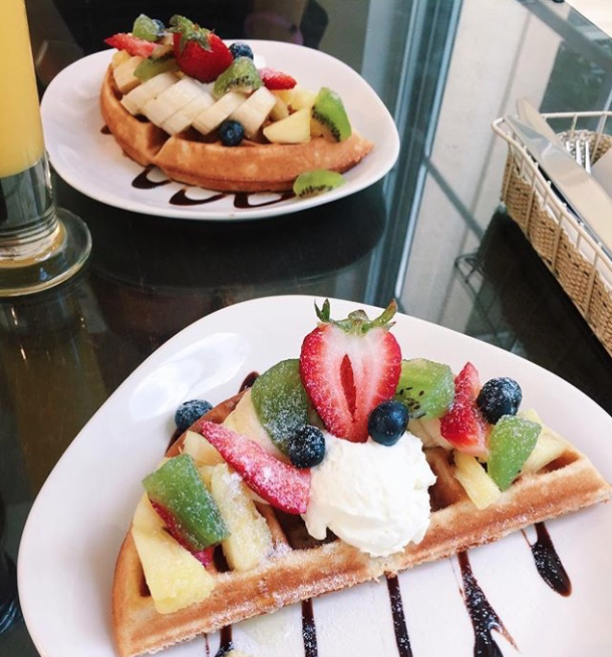 Although this cozy cafe may be a newbie, their waffles are already majorly talked about and praised within the foodie community. The waffles are cheap and delectable – only $4.50 for the regular size and $2 for the cute minis – and can be covered with any (or all) of their offered toppings for just 50 cents each. Go crazy. This esteemed breakfast joint in Jacksonville was featured on Diners, Drive-Ins, and Dives and was voted “best” in several categories in 2015’s Bold City Best competition. Meaning, as Guy Fieri would say, it’s so money. 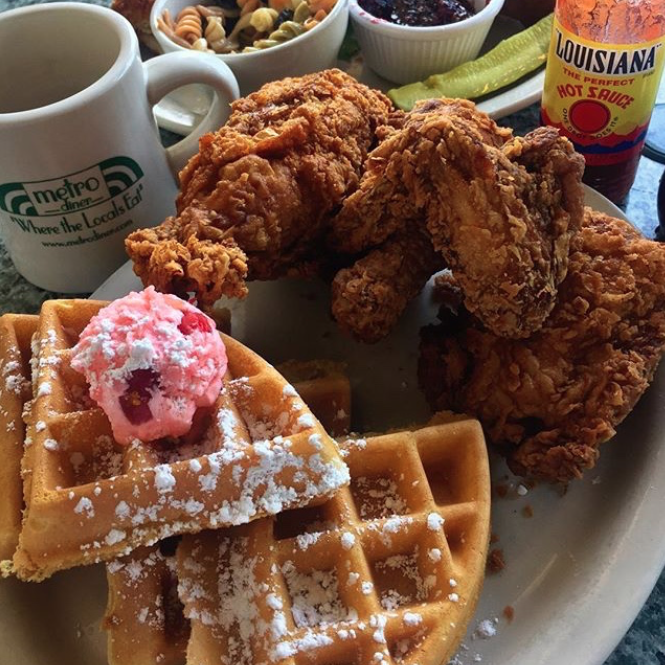 The fan favorite at Metro Diner is the fried chicken and waffle, which comes with half a fried chicken and a Belgian waffle topped with strawberry butter and their signature sweet and spicy sauce. If you’re not into the chicken and waffle combo, try the Fruity or Nutty waffles, filled with heaps of fresh fruit and nuts. You might’ve heard of sweet potato pancakes, but Folk Art in Atlanta is taking that a step further with their delectable sweet potato waffles. 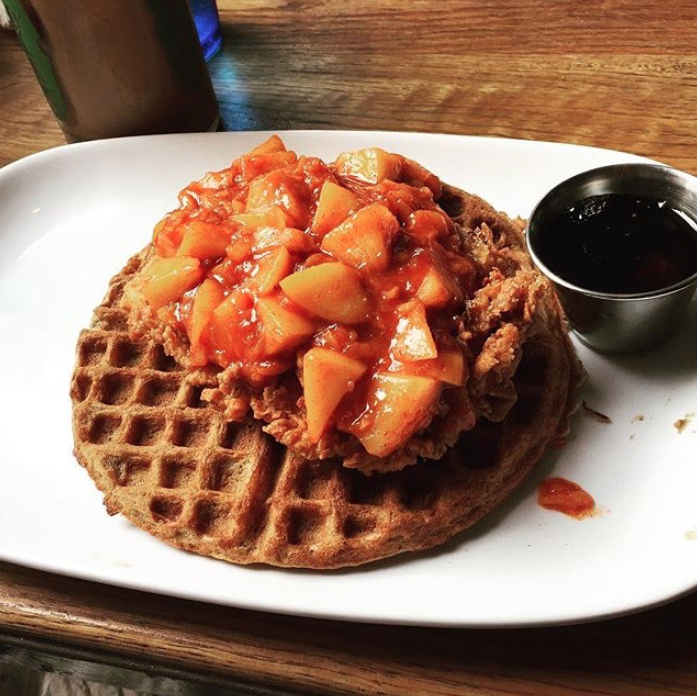 You can’t go wrong with any of their Southern waffle fusions, including the cinnamon pecan sticky bun waffle, the peanut butter and banana waffle, and most especially, the fried chicken and waffle with whiskey peach compote. “Exquisite” is in the name for a reason. Tilia’s is a retail store, product shop, and cafe all in one, allowing you to make only one stop for all your needs (mainly, waffles). 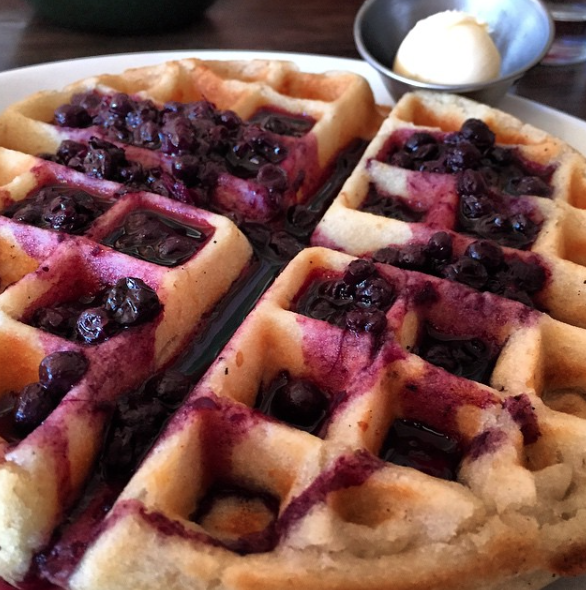 Their original waffle is made with taro plant, a staple of the Hawaiian diet. Top it with only the best seasonal fruits Hawaii has to offer and whipped cream, or get a waffle sandwich filled with your choice of turkey, pastrami, or egg and shrimp. #SpoonTip: Order the Kona coffee to go with your meal, because you can’t get coffee this good anywhere on the mainland. At this place it’s about more than just waffles, it’s what goes on the waffles that makes them extra superb. Choose from the plain, buckwheat, or honeywheat waffles and then load them up with as many toppings as your heart desires, including, but not limited to, cherry pie filling, bacon, pecans, ice cream, and a variety of fresh fruits. The menu at Waffles N More also lists 10 syrups for your waffles, such as huckleberry, boysenberry, apricot, pecan, and coconut. There’s almost too many to decide from. Okay yeah, the name says pancakes, but the waffles? Bomb. This place has been cooking up delicious waffles in the Chicago suburbs for 50 years, and the prized waffle at Walker Bros. is the bacon waffle, a Belgian waffle with their crispy, special recipe bacon mixed throughout the batter, and topped with whipped butter and syrup. 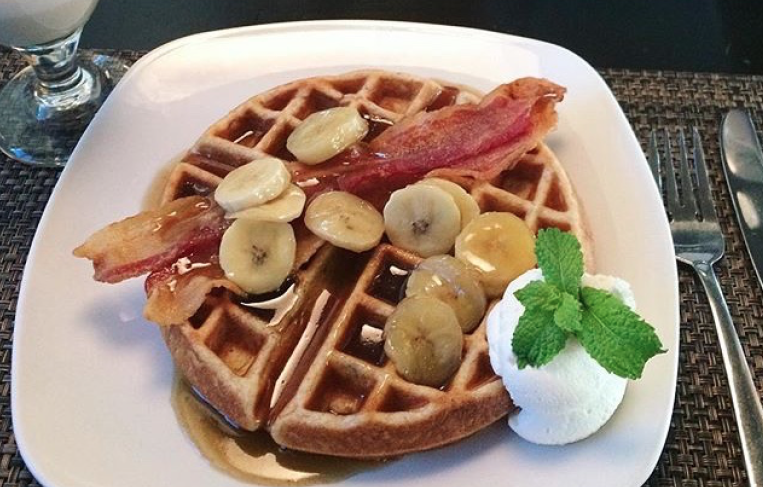 Who needs bacon on the side when you can have it mixed right in with your waffle? Along with providing great waffles, Cafe Patachou also partners with the Patachou Foundation to prepare food and staff community volunteers for children impacted by homelessness and hunger in the area. Which is just another incentive of eating here at this trendy and eclectic cafe. On their menu they offer a classic or gluten-free waffle with cinnamon sugar and warmed syrup, however occasionally they’ll add dishes named after children for the Patachou Fundraiser, such as Sweet Ruby’s Special, a Southern style sweet grilled cheese waffle. As an Italian restaurant, one wouldn’t usually think to head to +39 for their Sunday morning waffle craving. But you should. 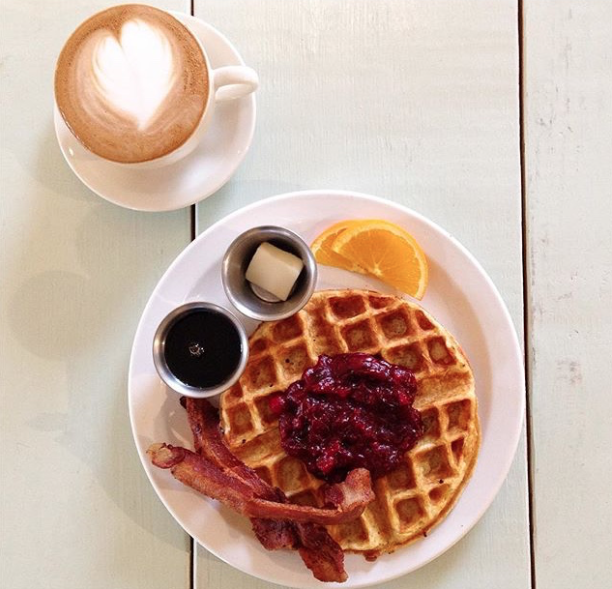 Not only do they have a traditional Italian espresso bar, but they serve up an excellent whole wheat waffle with cherrywood smoked bacon and banana’s foster sauce. Trust me, it doesn’t get better than that. Urban Table in Kansas City is a modern American bistro that prides themselves in their fresh, scratch-made food using seasonal ingredients. Their waffles are mini and adorable, but are still full of all the deliciousness of a regular sized waffle. Soak your waffles in bacon-praline syrup, maple vanilla syrup, or raspberry caramel for the ultimate bangin’ waffle experience. Lexington Diner is on a mission to rekindle the love for home cooked foods by using as many local produce and other ingredients as they can. 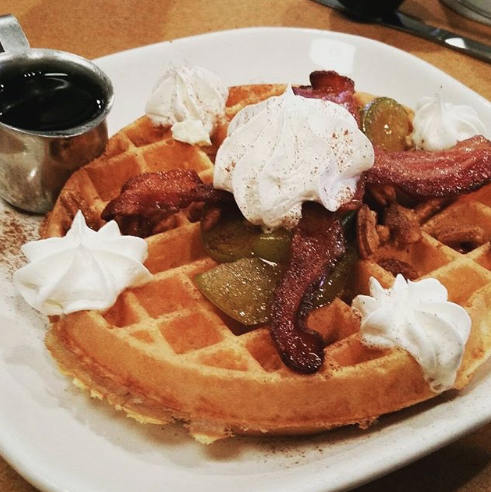 The diner’s waffles are topped with fresh, seasonal ingredients like spiced apples, berries, and pears. They also make their own version of Bourbon chocolate and caramel sauces. Because we could all use that extra kick in the morning. This joint in the heart of New Orleans is whipping up some fantastic breakfast food you don’t wanna miss. They serve the southern classic of chicken and waffles, and the not-so-typical but absolutely delightful waffles topped with grilled brie, blueberry compote, and powdered sugar. Cheese and waffles? Yes please. The Bayside Cafe is located in Portland, only a couple blocks away from the coast, providing them with local seafood and other ingredients from across the world. The favorites are the pecan caramel waffle and the chocolate waffle, a dark chocolate Belgian waffle with fresh strawberries and whipped cream. 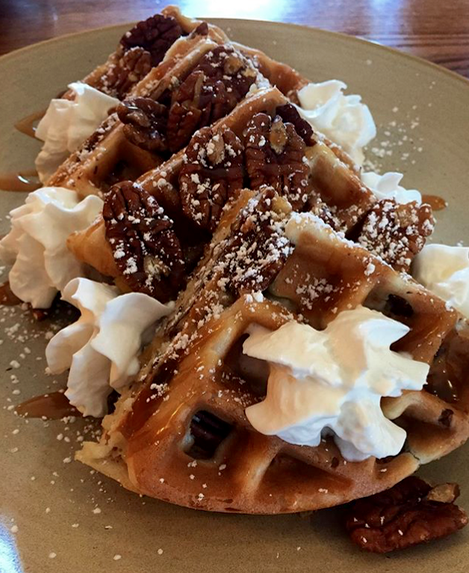 The pecan caramel waffle is pressed with toasted pecans, drizzled with caramel, and topped with whipped cream. You’ve heard of chicken and waffles, but how about pulled pork and cheddar cornbread waffles? Yup, Café Rue went there. 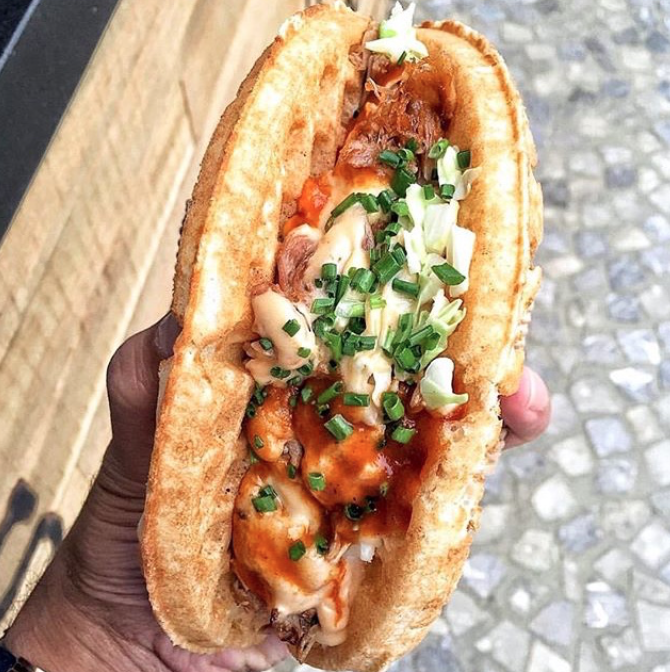 It’s the ultimate barbecue experience all wrapped up into one excellent waffle creation. This Euro-inspired cafe with a modern twist also specializes in their signature red velvet waffle and Sriracha glazed waffle. For those unwilling to try out these unexpected flavor combinations, they still provide the classic chicken and waffles. Zinneken’s boasts that they have the best Belgian waffles outside of Belgium. They import all of their ingredients from Europe, and bake their waffles right in front of you so you can see the magic behind their soft centers and crispy outsides. You can then choose from their variety of topping combinations, including “Strawberry Glamour” which is fresh strawberries and real Belgian chocolate, and “The Sin” which is bananas and Nutella. Zola Bistro is a chic brunch spot located in Ann Arbor, bringing in tons of people desperate to try their fancy waffles. Top a classic waffle with fresh fruit or nut butters, or keep it simple (yet still delicious) with Michigan maple syrup. 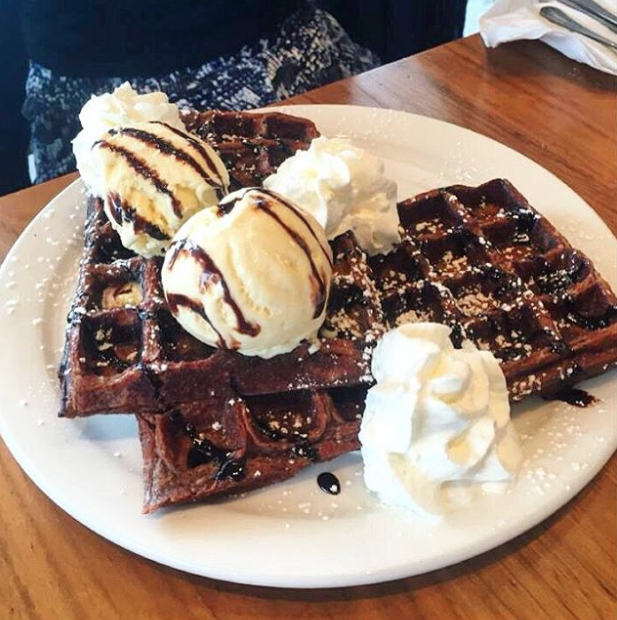 Or, indulge your sweet tooth with a Zola favorite, the Chocolate Snowball waffle, which is topped with vanilla ice cream from Guernsey Dairy, shredded coconut, Belgian chocolate ganache, and whipped cream. 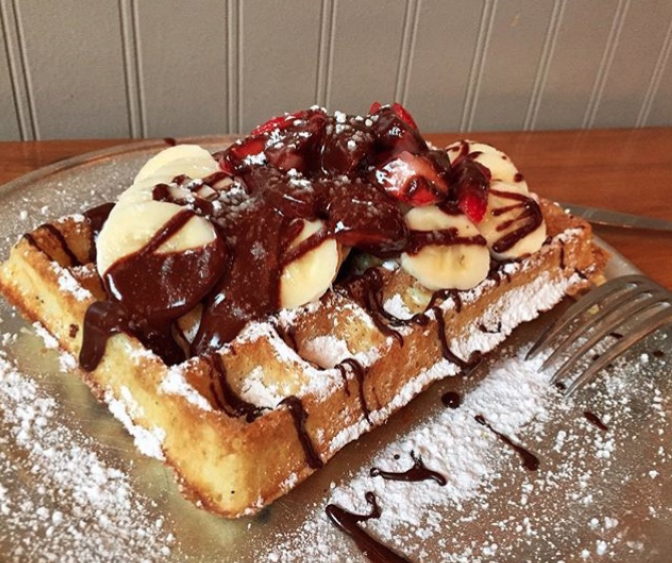 Waffle bar > actual bar. 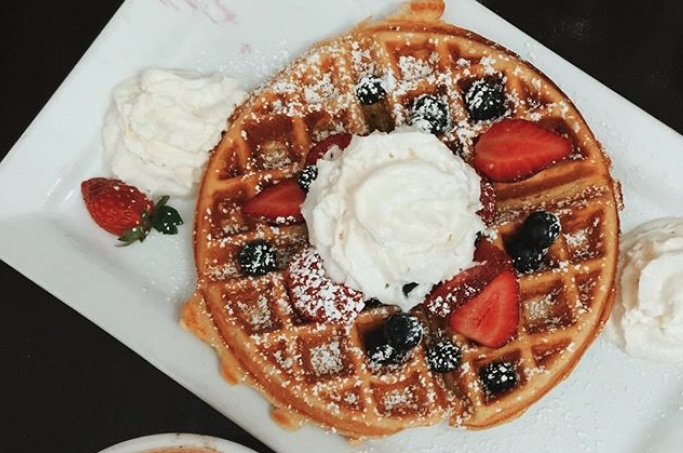 Black Coffee and Waffle Bar prepares all waffles and toppings homemade, in-house and with fresh ingredients, so you know it’s gonna be ridiculously good. 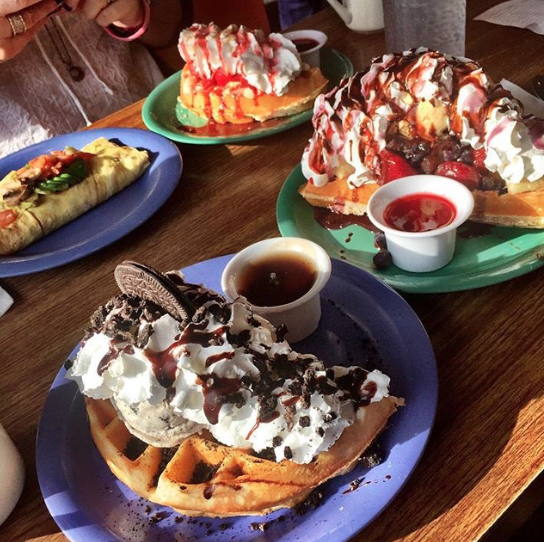 Choose from their signature (and interestingly named) waffles, including One Bad Pig, the Muddsucker, or The Fat Andrew, or build your own personal waffle using any crazy combination of toppings you’d like. This restaurant is anything but bad. Their giant, golden Belgian waffle gets a makeover from any waffle you’ve seen in a restaurant before as the “Pylon”. This is topped with a split, griddle fried hot dog, chili, slaw, cheddar, mustard, onions, chopped pickles, jalapeños, and crackers. Known as “a hangover’s worst enemy“, you’d have to be a brave soul to try this one out. Here at Melt they’re making their waffles #Merican style, instead of the highly popular Belgian style most restaurants are adopting. 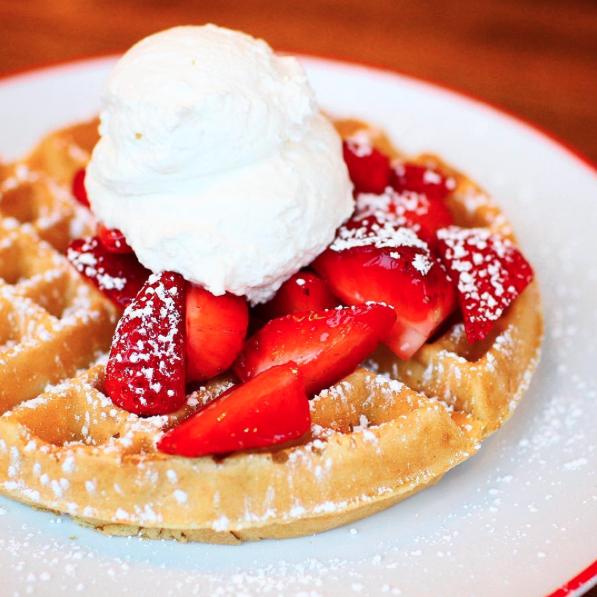 American waffles are denser and thinner than Belgian waffles, as well as chewier, lighter, and equally delicious. At Melt they have five different waffle batters to choose from; house (a plain waffle), biscuit, cornmeal, vegan (made with sweet potato puree), and gluten-free. 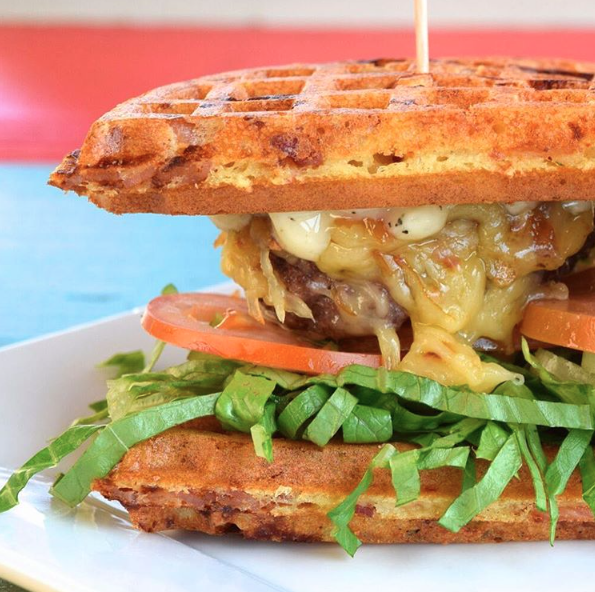 These are made into mouth-watering waffle sandwiches, waffle burgers, grilled cheese waffles, and plenty more funky waffles that you never would’ve even thought up before. #SpoonTip: If you’re a huge fan of Chick-fil-A’s waffle fries, order Melt’s version, which uses fluffy house waffles sliced like fries and sprinkled with sea salt, and can be served with yummy dips like beer cheese, the jam of the month, or their vegan dilly ranch. The Nova Cafe is serving up “the best breakfast in Bozeman” 8 years in a row in their locally owned, family friendly restaurant. Their griddle offers a regular Belgian waffle as well as a cheesy Belgian waffle topped with local eggs and bacon that they call, “The Morning After”. No worries if you’re gluten or dairy-free either, they also serve a delicious chia seed waffle topped with coconut oil just for you. At Petrow’s Restaurant in Omaha they’re serving up homemade malted waffles, which are made with malted-milk powder to give their waffles a sweet and crispy flavor. They’re home to “Nebraska’s Best Waffle Breakfast”, a made to order waffle topped with black walnut ice cream, English walnuts, and maple syrup. 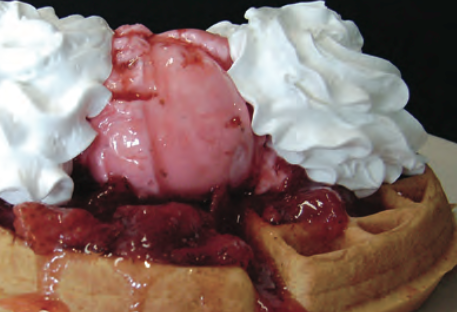 If you have a nut allergy go for the equally delicious Strawberry Waffle, which is instead topped with strawberry ice cream, strawberry syrup, and whipped cream. Dessert and breakfast go so well together, don’t you agree? The waffle tacos Bruxie’s serves up in Las Vegas are something you’d only dreamed of before now. 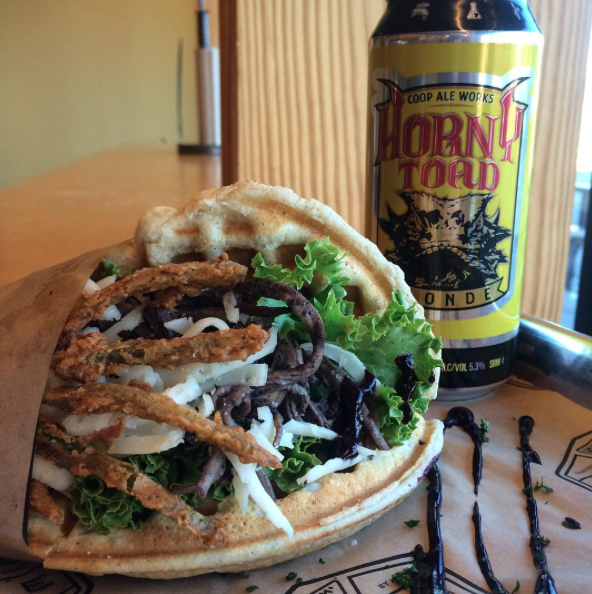 The Bruxie Waffle is a savory waffle that’s made light and crispy, and as a bonus is only 250 calories. Putting a spin on the original chicken and waffle, these waffles are filled with your choice of buttermilk fried chicken, buffalo chicken and blue cheese, pesto chicken, or for all y’all on the East Coast, North Carolina BBQ chicken. 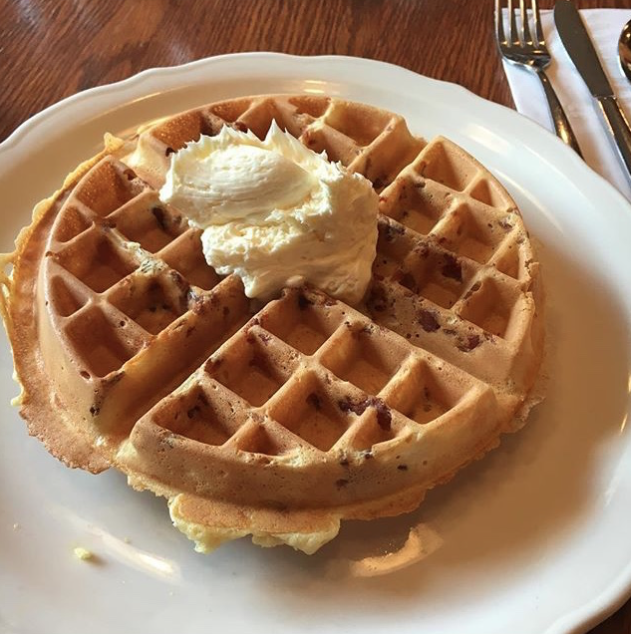 Stop in The Friendly Toast in Portsmouth for great service, a fun atmosphere, and of course some scrumptious waffles made with fresh, locally sourced ingredients. Esquire said it’s “one of the best breakfast places in America,” so you should definitely try it out for yourself. They make their waffles from a homemade mix and can be served with a bottle of real maple syrup from Fuller’s Sugarhouse, or made Caribbean style with caramelized bananas and crushed pecans & cashews. I don’t think you want to pass up the caramelized bananas folks. With 11 locations spread around New Jersey, this is a place you can’t miss even if you wanted to. Try the Bananas Foster waffle that upholds the New Orleans tradition with a homemade waffle topped with split bananas, a sweet dark rum sauce, and toasted pecans. Or, explore your island side by ordering the Tropical Punch waffle which is covered with fresh bananas, strawberries, mangos, and granola, served with a strawberry reduction sauce. 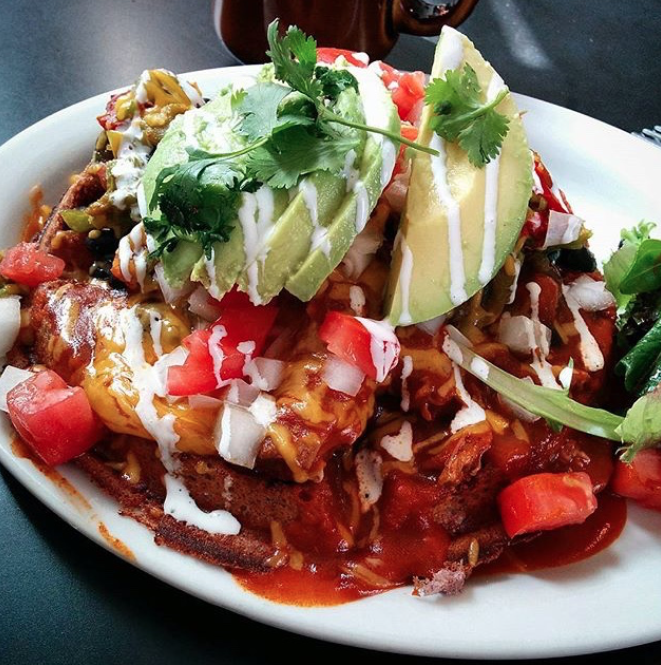 What happens when you combine Mexican food and breakfast? These amazing waffles from Tia B’s La Wafflería in Albuquerque, of course. Build your own authentic waffle creation starting with a base of their made-from-scratch batters including blue corn/buttermilk, buckwheat/sour cream, and rice/coconut, which is vegan and gluten free. Then choose from a selection of sweet or savory ingredients to be cooked inside your waffle, and top it all off with house-made sauces, infused whipped cream, or Mexican toppings like carne adovada and red or green chiles. 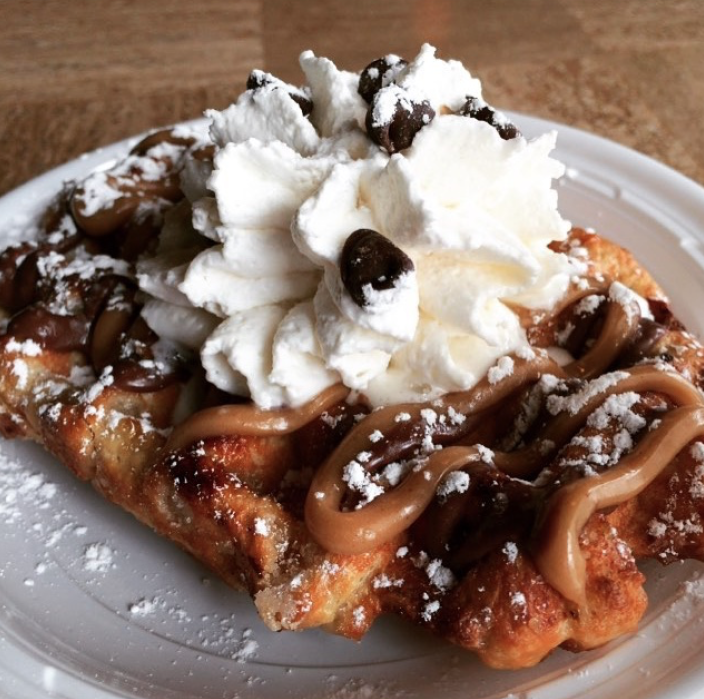 At Wafels and Dinges food truck, a dinge is just a super fantastic topping for your waffle. Basically, they’re taking an already delicious waffle and adding a bunch of even more delicious stuff on top of it. 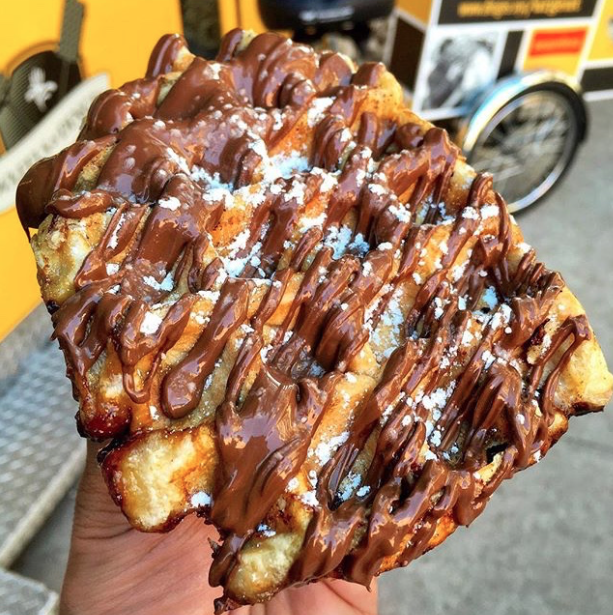 For just $3 extra you can get the “Waffel of Massive Deliciousness” and pile on as many dinges as your heart desires, such as Belgian chocolate fudge, speculoos spread, nutella, dulce de leche, and so much more. If you’re looking for a great place to indulge in all your sweet and sugary cravings, you’ve come to the right place. At Cast Iron Waffles in Charlotte they’re busting out fresh-made Belgian Liege waffles from a 100-lb. cast iron waffle press on the daily. Indulge your sweet tooth with the Cinnamon Roll Waffle, or push it to the max with the Peanut Butter Cup waffle, topped with a cream cheese peanut butter mixture, chocolate, and whipped cream. Although best known as the trendy bar located in downtown Fargo for their craft cocktails, wines, and beers, The Boiler Room also serves up an appetizing breakfast on Saturday and Sunday mornings. 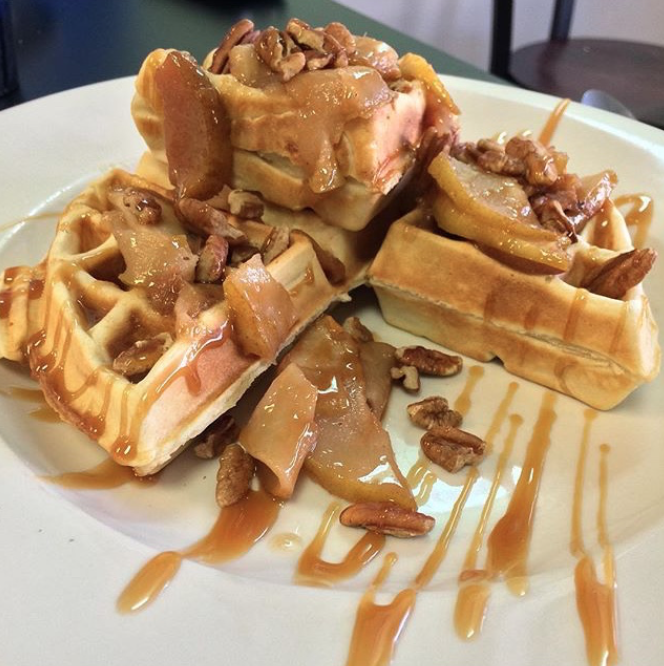 Their signature waffles include the bacon waffle and chicken and waffles smothered in sausage gravy. 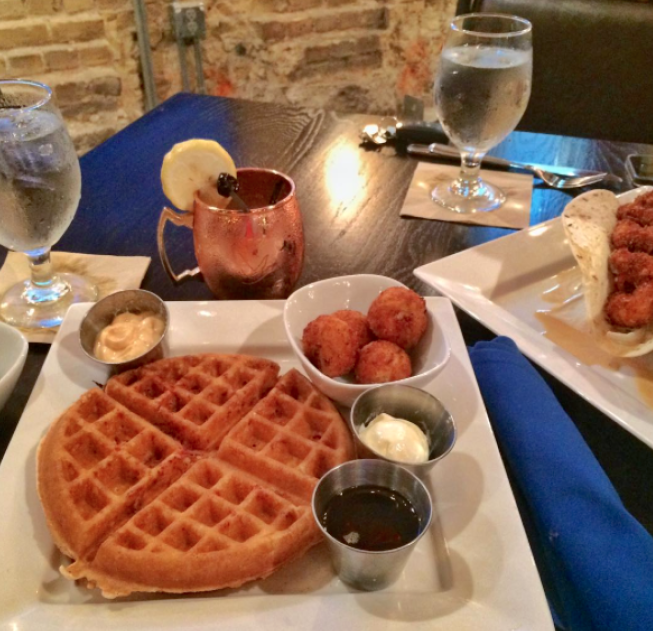 You also can’t go wrong with their three cheese tater tot hot dish and scotch eggs to accompany your waffles. Because as we all know, the more carbs the merrier. 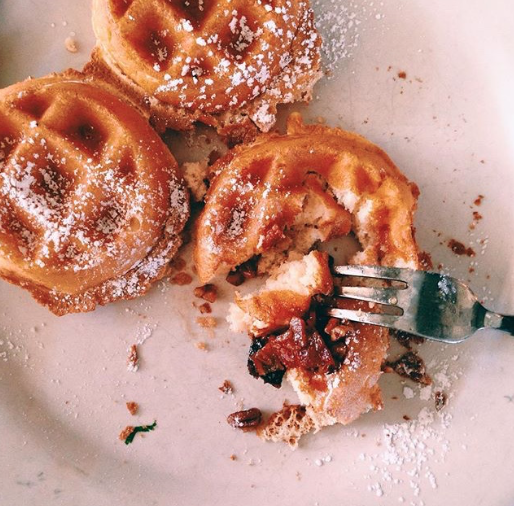 These aren’t your ordinary waffles. This place serves up what they call “Superwaffles”, which come in all different colors, shapes, and sizes. There’s the famous “HULK” waffle, a green waffle sandwich with eggs, cheese, sausage, candied bacon, and a maple syrup drizzle. 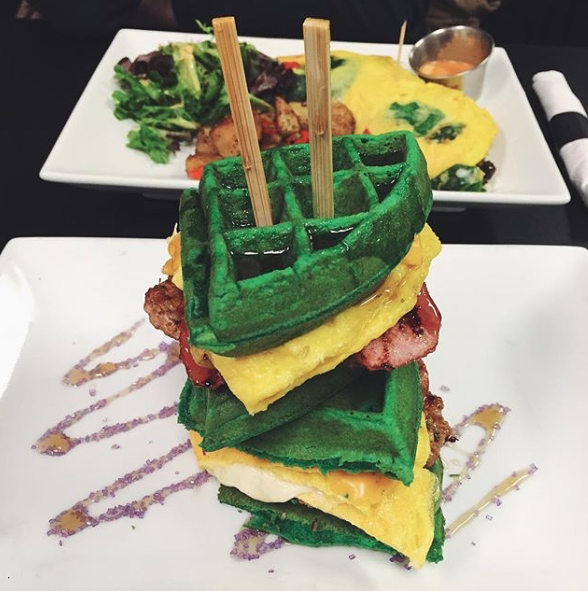 If you couldn’t handle Green Eggs and Ham, this is not the waffle for you. For those who are a little more classic when it comes to breakfast choices, go for the Cinnamon Toast Crunch or Elvis waffles. No matter which waffle you choose at SuperChef’s, it’s sure not to disappoint. 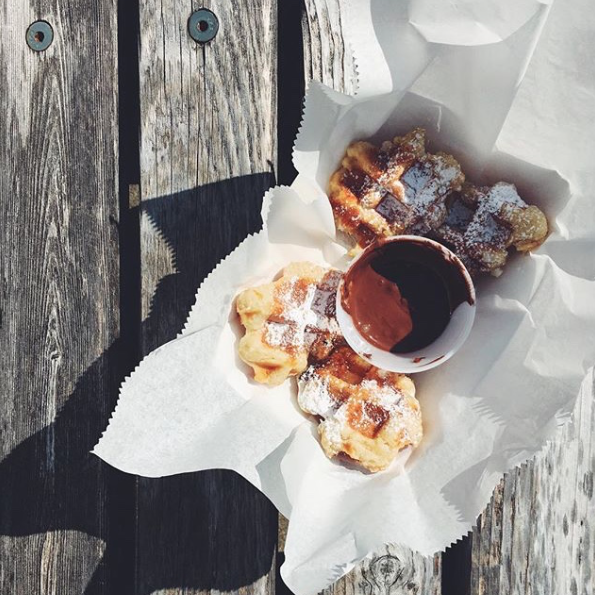 The self-proclaimed champion of waffles can be found in Oklahoma City, where they’re dishing out all different kinds of hand-crafted waffle sandwiches and sweets. Personally, I would go for the pizza grilled cheese waffle sandwich, because it contains all of my favorite things in one and is sure to be insanely good. But if you’re craving something sweet, order the Fool’s Gold, which is a waffle with peanut butter mousse, stawberry-anise compote, candied bacon, and fresh bananas. The Waffle Window in Portland is a cute little cafe that’s serving up some seriously good waffles. 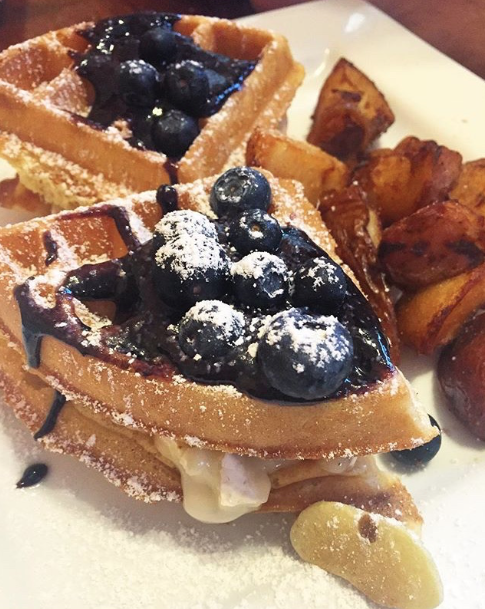 They offer Liege waffles, freshly baked, and topped with house made local and seasonal ingredients such as avocado tomatillo salsa, black forest ham, blueberry cinnamon compote, and cheesecake pudding. With over 15 different waffle combinations to choose from, it’s sure to be one of the hardest choices you’ll ever have to make in life. 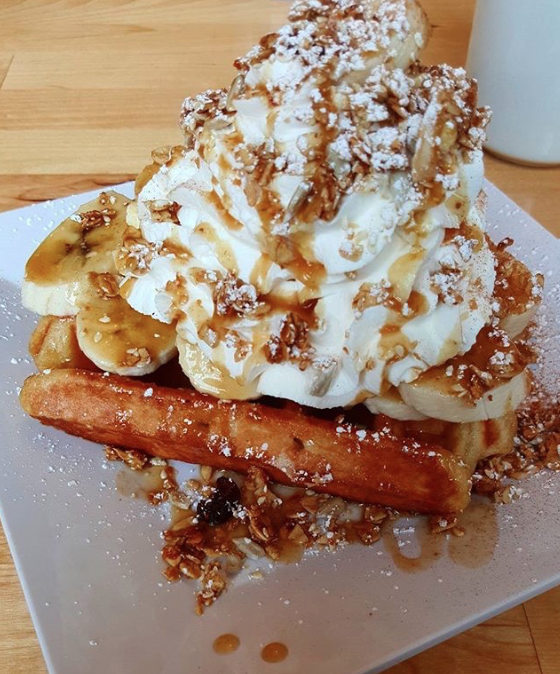 #SpoonTip: Take your typical sundae to a whole other level by ordering the Banana Caramel Sundae Waffle, which is a hot waffle topped with fresh bananas, vanilla ice cream, banana caramel sauce, house made granola, and fresh whipped cream. Nina’s wonderful world of sweets was founded by a Belgian who as a child dreamed of opening a waffle shop here in the US. 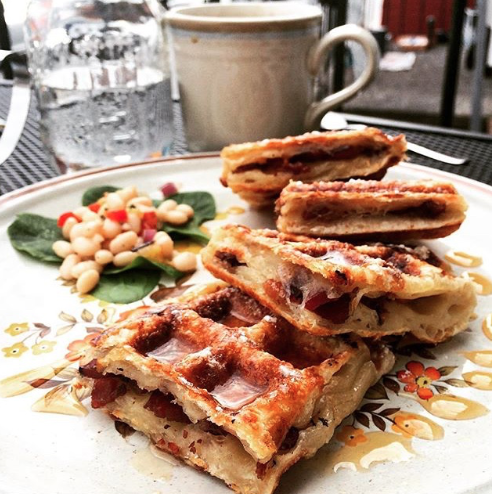 These waffles are made in the Liege waffle tradition by combining a yeasted bread dough, similar to brioche, with pearl sugar derived from sugar beets that caramelize as the waffles are cooked in a heavy iron. Satisfy your sweet tooth with a waffle sundae topped with your choice of over 100 flavors of hand-crafted ice cream. “A little place with a big heart,” Laura’s is a friendly little joint in Smithfield that serves breakfast all day, 364 days a year. 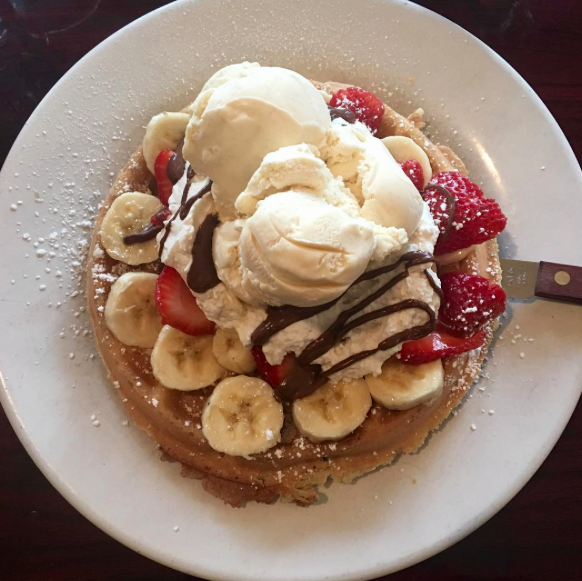 Their Belgian waffles are homemade and can be ordered plain or topped with one, two, or three toppings of fresh fruit like strawberries, blueberries, bananas, and peaches, or apple cinnamon, chocolate chips or walnuts. Parlor Deluxe in Charleston is putting a modern spin on the classic soda fountain, with their unique takes on floats, hot dogs, ice cream, and duh, waffles. Perhaps the most innovative thing they’re serving is their waffle ice cream sandwiches and waffle sundaes. 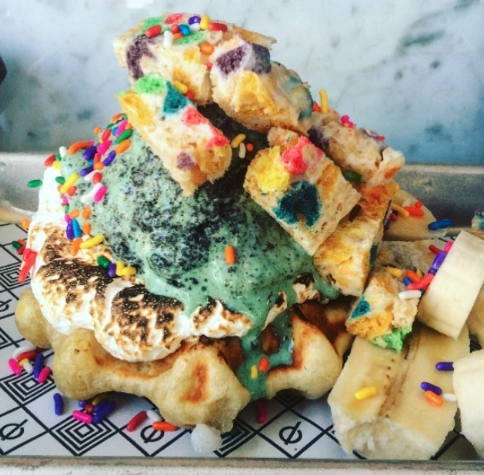 These creations are daily inspired, but past menu items include the Burnt Fluff Waffle Sundae, a marshmallow fluff and chocolate sauce topped waffle, torched for ultimate gooey marshmallow-ness, and a chocolate-dipped waffle with pistachio ice cream sandwich. This funky, retro diner is serving up classic all-American food complete with dazzling neon lights, a jukebox, and interesting food phrases. 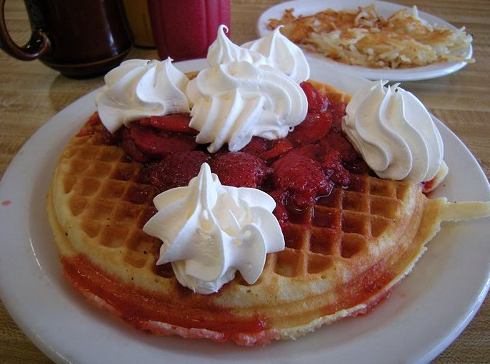 Waffle Wednesday’s are a special day at Phillips Avenue Diner, when waffles prices are lowered and syrups are raised and ready to be poured. Waffles choices include the Belgian, Sunrise, and Apple Jack, which is topped with whiskey caramelized Granny Smith apples, bacon, toasted pecans, and cinnamon whipped topping. The Tavern is a casual, foodie favorite “gastro-pub” located in Nashville with an energetic atmosphere and creative cuisine. For brunch they serve up all sorts of innovative menu items, including a breakfast stir fry, braised short ribs, and of course, specialty waffles. 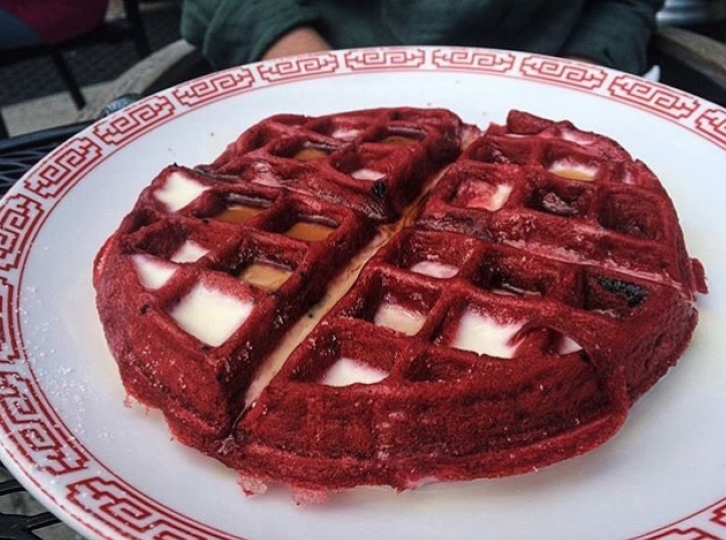 The favorite is the red velvet waffle, which is served with cream cheese drizzle, because having dessert for breakfast is never a bad thing. Then there’s the blueberry cornmeal waffle, topped with a sweet cinnamon molasses and whipped mascarpone. 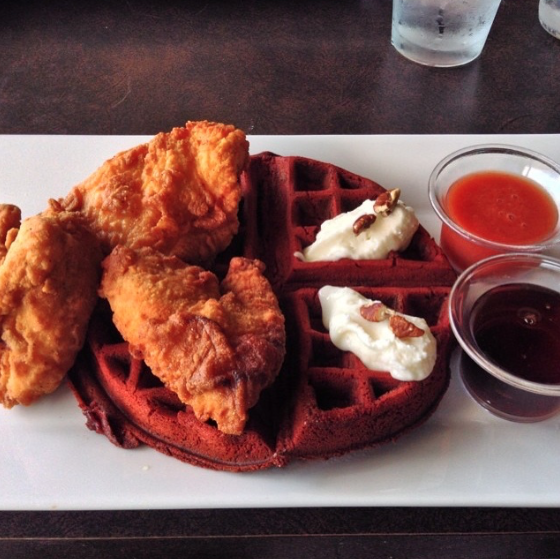 Chicken and waffles is one of the most important breakfast dishes for Texans. There’s no shortage of restaurants cooking up this Southern staple, however Brunch Haus, a food trailer in Austin, has some of the best. 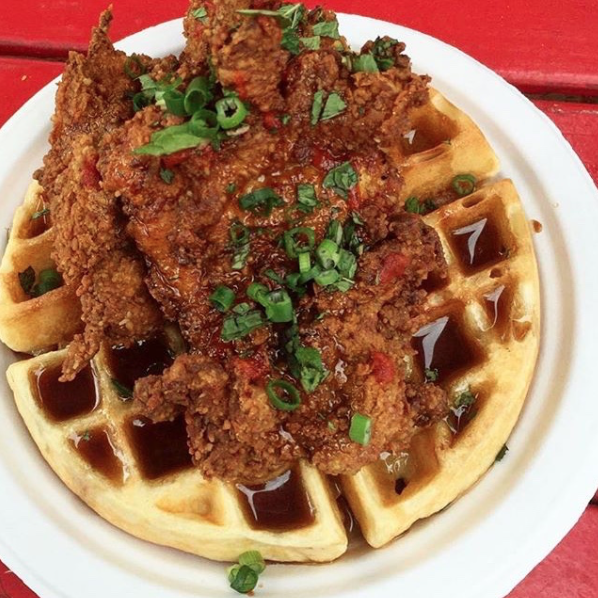 Their take on the dish is made from deep fried, buttermilk brined and battered organic chicken thighs, served on top of a savory waffle and drizzled with ginger clove lemongrass syrup. This makes us believe that everything really is better in Texas. 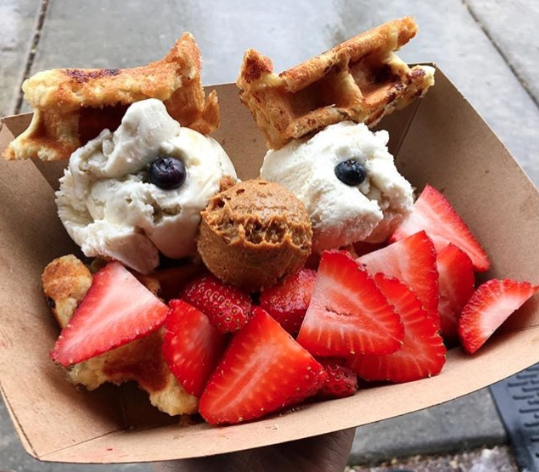 The owners of this ingenious restaurant were born and raised in Belgium, and after living in Salt Lake City for 10 years decided to start selling waffles from a cart on the street using an old family recipe. Bruges specializes in their Torpedo Waffle, a Liege waffle stuffed with whole bars of Belgian chocolate, and the Waffle Monster, which is filled with crunchy speculoos spread, vanilla bean ice cream, and strawberries made to look like a face, complete with blueberries to make up the eyeballs. 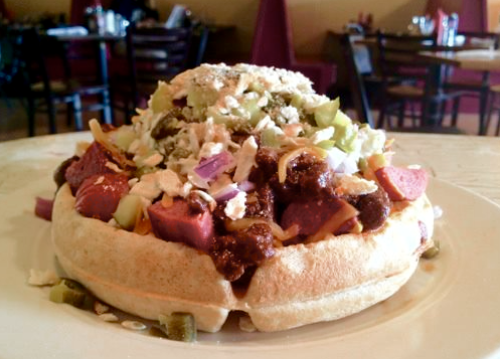 At The Swingin’ Pinwheel in Burlington they’re serving up a serious waffle sandwich. Called the “wafflini”, it’s a cross between a panini and a waffle, allowing for two favorite breakfast and lunch dishes in one. Choose between their savory filling combinations like prosciutto, gouda, and honey, or mango, poblano, red onion, and brie, which are mixed into the waffle batter and baked in a waffle iron. This waffle shop located on the oceanfront in Virginia Beach bears a very cool vibe, as the inside is decorated with American Indian murals and statues, and contains an authentic Indian Tee Pee. Can you think of a cooler place to enjoy some waffles? I sure can’t. 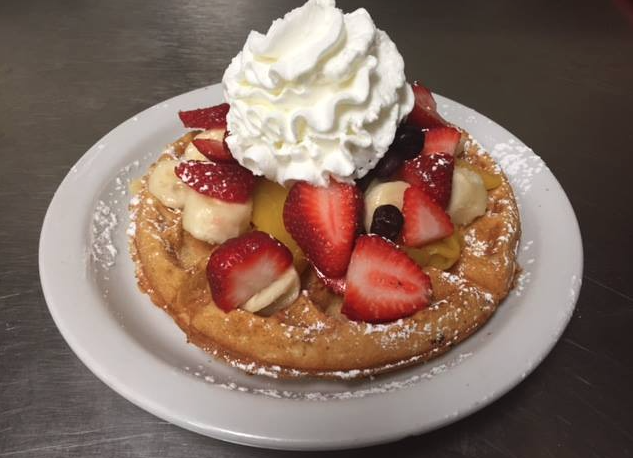 Pocahontas Waffle Shop is serving up Belgian “egg-rich” waffles that can be topped with a variety of fresh fruits, chocolate chips, whipped margerine and powdered sugar, and of course plenty of whipped cream and syrup. I think Leslie Knope would undoubtedly approve of this place. Not your typical brunch spot, Agrodolce is a Sicilian restaurant in Seattle that uses organic and sustainable ingredients from the Pacific Northwest. 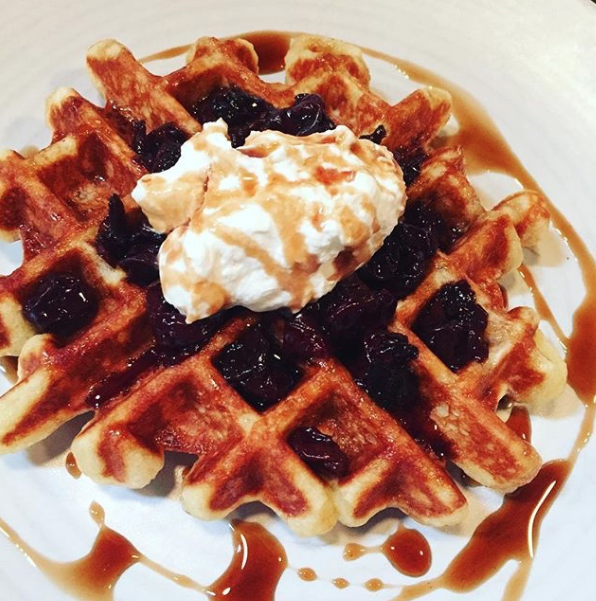 Their brunch, which includes bottomless mimosas (holla), features a semolina waffle with tart cherries, toasted almonds, and a balsamic reduction sauce, taking your typical waffle to the next level of deliciousness. They also put a spin on the southern classic of fried chicken and waffles, serving them with Skagit River Ranch bacon, marsala gravy, and a poached egg. Who knew Southern and Italian would go so well together? Vandal’s Kitchen prides themselves in “honest food” that uses whole, locally sourced, fresh ingredients to create classic Southern homestyle breakfasts. Their waffles are best topped with sweet honey, apple compote, fresh crumbled bacon, and feta cheese, a customer favorite. 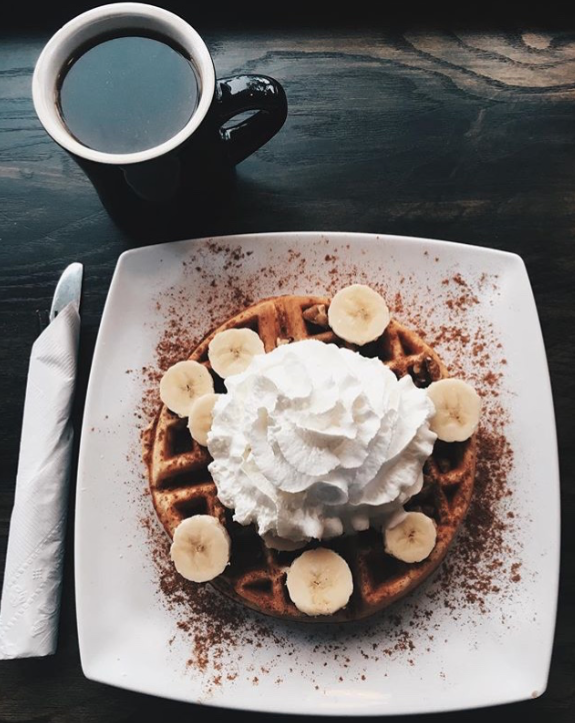 Enjoy a cup of Vandal’s coffee with your waffles, which is roasted in Ithaca, New York and sure to give you a much needed morning pick-me-up. Yola’s is a popular corner cafe in Madison that’s family owned and perhaps best known for their thick Golden Malted Belgian waffles. Grandma Yola prepared them the classic way, simply dusted with powdered sugar, however you’re able to create your own unique and delicious waffle however you like it. Ask for chocolate chips, strawberries, or blueberries baked into your waffle, and then pile it up with toppings like bacon, peanut butter, bananas, vanilla a la mode, and/or chocolate or caramel sauce. This café in Jackson is known for serving yummy foods that are organic, sustainable, and made from scratch. 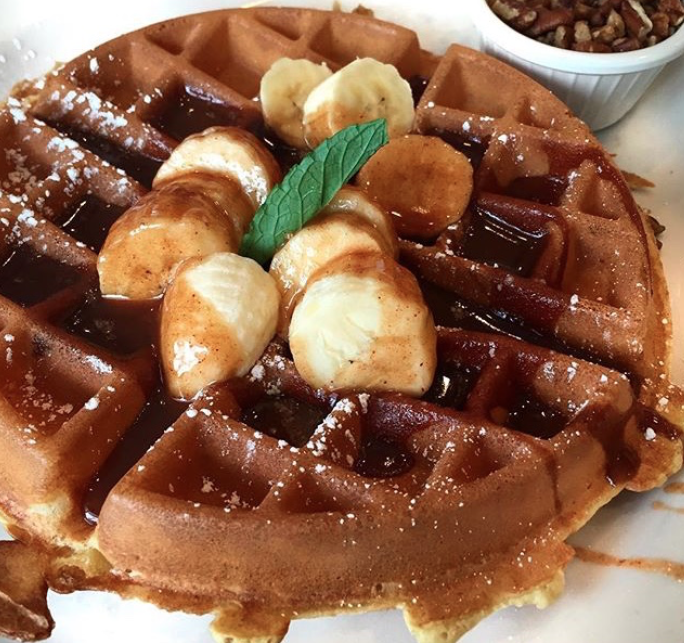 Their golden Belgian waffle is gluten-free and vegan and is topped with your choice of blueberry-ginger or strawberry compote, served with pure maple syrup. Finally, a waffle you can truly feel good about eating. #SpoonTip: Order one of Lotus Café’s fresh extracted juices to go with your waffle; juice pressing regenerates cells quickly in your body, healing diseases and providing a rejuvenating energy lift. Our founding fathers would surely enjoy the farmhouse waffles this place is serving up in our nation’s capital. The restaurant was started by the North Dakota Farmers Union (NDFU), with the goal of providing delicious foods that are grown, raised, and harvested on family farms in America. 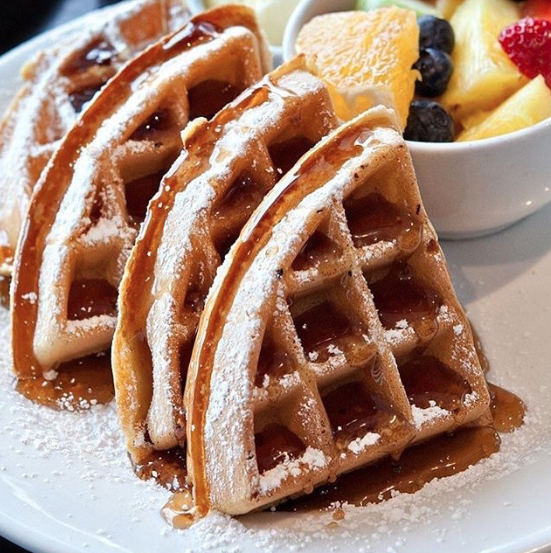 The waffles at Founding Farmers are made from scratch everyday, and can be topped with either fresh strawberries and cream, maple cinnamon sugar, bananas foster, or fried chicken. In America, freedom is best served with delicious waffles.